This single gold glove logo baseball display case is made of 1/8th inch thick acrylic. 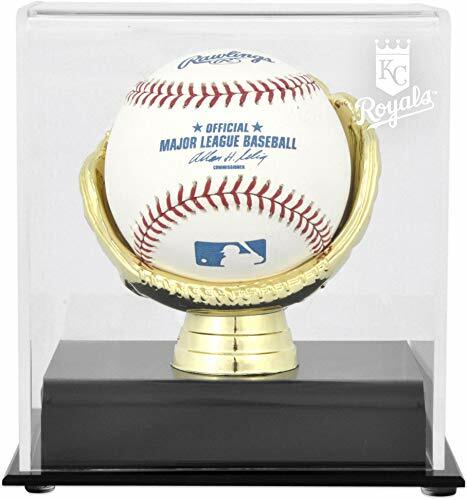 Features a black acrylic base which supports one gold glove where the ball is placed into and has a clear acrylic lid. Measures 5" x 4 1/8" x 5 3/8". This is for the display case only. Memorabilia not included. 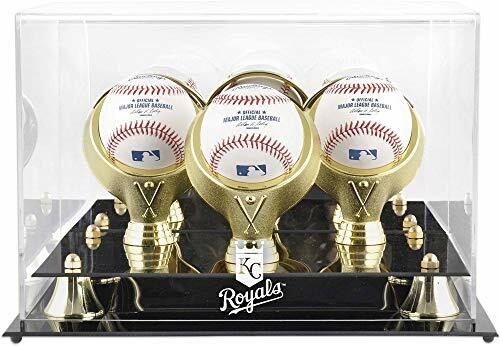 The golden classic logo baseball display is the perfect item for presenting three collectible baseballs. Ideal for a themed collection. Made of 1/8th inch thick acrylic. Features a black acrylic base which supports three gold rings where the balls are placed into and has a clear acrylic lid. Measures 12 3/8" x 9 7/8" x 9 1/8". This is for the display case only. Memorabilia not included. This gold two glove baseball display case is made of 1/8th inch thick acrylic. It features a black acrylic base which supports 2 gold colored baseball gloves. Inside the gloves are where the baseballs can be placed. The lid is made of clear acrylic. Comes engraved with your favorite teams logo. Measures 13 1/2 x 7 1/2 x 5 1/2. This is for the display case only. Memorabilia not included. 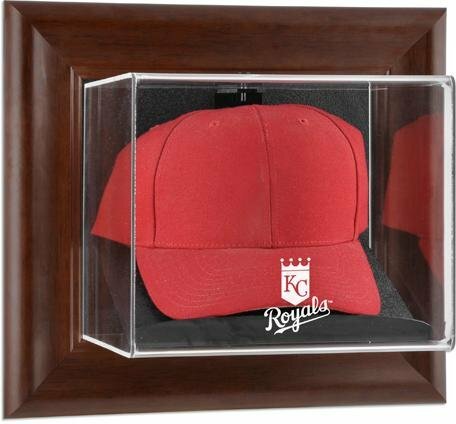 This brown framed wall mountable cap display case is made of 1/8th thick acrylic and is officially licensed by Major League Baseball. It features a removable lid engraved with the team logo, and is perfect for displaying your prize collectible. Outer measurements: 13 1/2" x 7 3/4" x 12". Inner measurements: 8 3/4" x 7 1/4" x 7 1/4". This is for the display case only. Memorabilia not included. 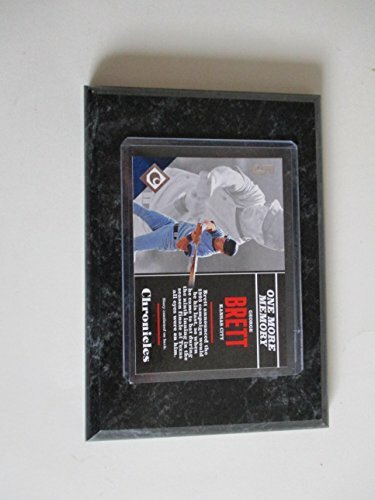 This brown framed wall mountable baseball display case is made of 1/8th thick acrylic and is officially licensed by Major League Baseball. It features a removable lid engraved with the team logo, and is perfect for displaying your prize collectible. Outer measurements: 12" x 5 3/4" x 11 3/4". Inner measurements: 7 1/4" x 5 1/2" x 7". Memorabilia sold separately. 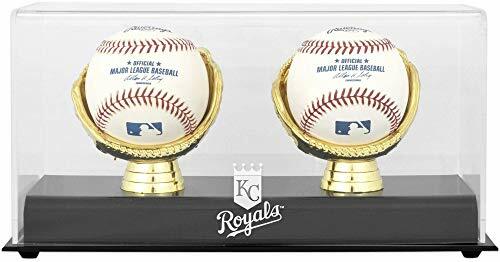 The deluxe 2-ball cube display case is the perfect item for presenting two collectible baseballs. Ideal for a themed collection. Made of 1/8th inch thick acrylic. Features a black acrylic base which supports two gold rings that the balls are placed into and has a clear acrylic lid. Comes engraved with your favorite teams logo. Measures 7 x 13 1/4 x 8. This is for the display case only. Memorabilia not included. 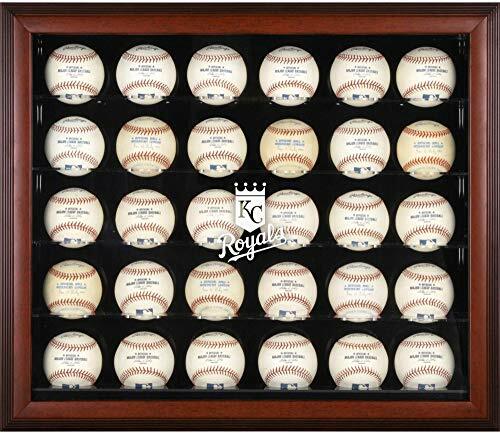 The framed 30 ball case is perfect for showcasing your valuable baseball collection. The case is framed in a mahogany wood step frame and holds 30 baseballs. It features 5 individual shelves which each house 6 baseballs. 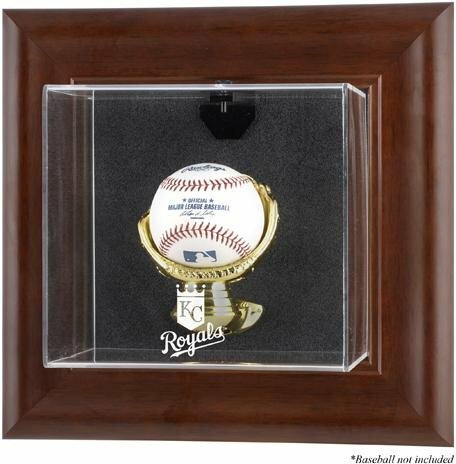 Looking for more Mounted Memories Kansas City Royals Memorabilia similar ideas? Try to explore these searches: Lather Free Shampoo, Sweet Corn Varieties, and Kent Antique Print. 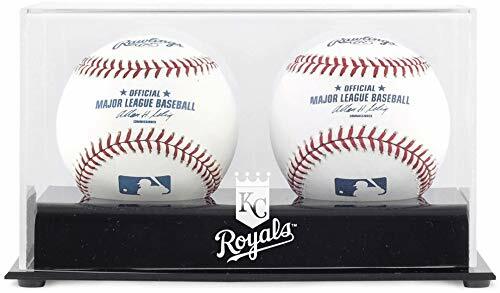 Look at latest related video about Mounted Memories Kansas City Royals Memorabilia. Shopwizion.com is the smartest way for online shopping: compare prices of leading online shops for best deals around the web. 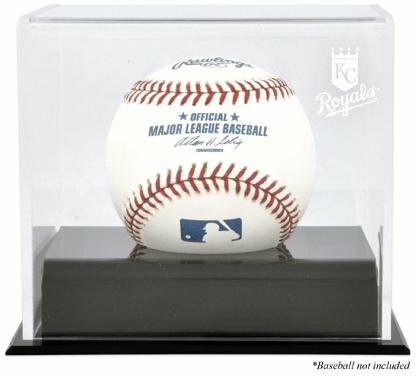 Don't miss TOP Mounted Memories Kansas City Royals Memorabilia deals, updated daily.